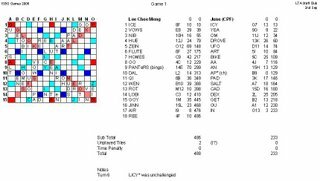 The ISBG Scrabble games is held every two years, for statutory boards to take part in a friendly game of Scrabble. It was held at the LTA Staff Club on 2nd September 2006 from 10am to 4.30pm. Our first game was against CPF which was the team that I most wanted to play with! My opponent was a jovial girl whose name was June. She claimed to be new to the game but she is pretty quick at calculating the scores! I calculated the score for one word wrongly as I mistook the double letter score to be a triple letter score and she promptly pointed out the mistake. Had a pretty easy time as I scored well with ZEIN(69), HOMES(42), QI(36), WEN(39) and GOY(35). 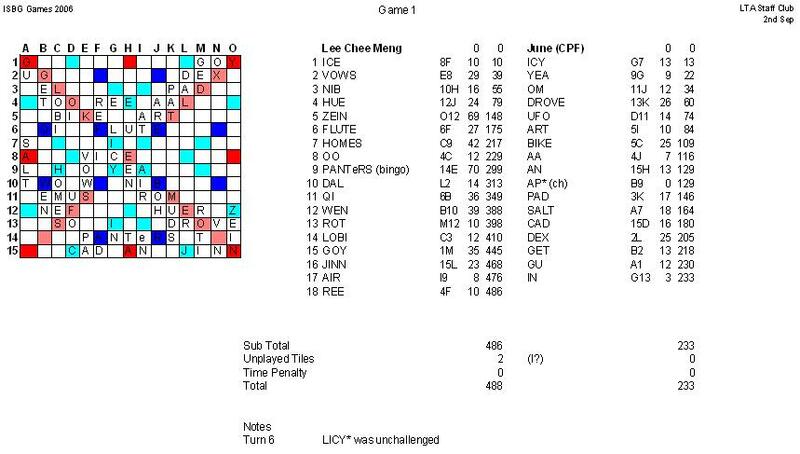 I also bingoed with PANTeRS(70) and got away with LICY*. My opponent had no bingos and none of her words scored more than 30 points. It was only after the game that she found out that LICY* was a phoney and she shouted "Ni Pian Wo!" at me subsequently. Was quite embarassed as I was worried that people might wonder what serious sins I have committed for her to say that! Won my first game with 488 to 233. My team also won the match 3-2! Our second game was against EDB. One of the players was my school mate! 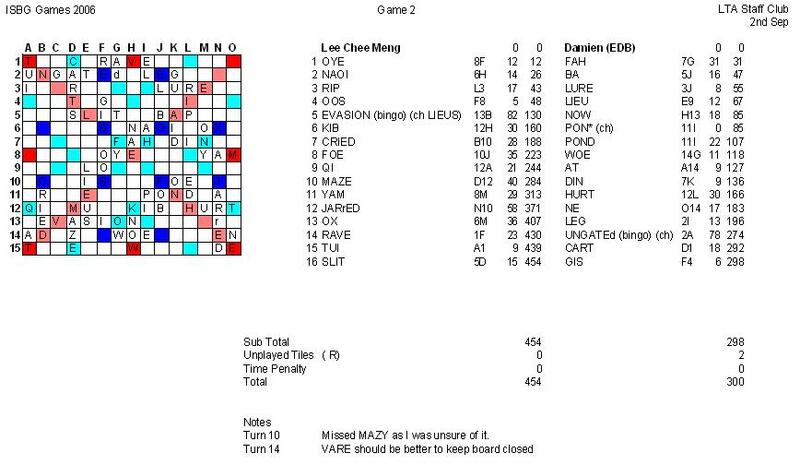 My opponent started strongly with FAH(31) after I put down OYE. Then I started to lead when I bingoed with EVASION(82). I scored well with KIB(30), FOE(35), MAZE(40), JARrED(58) and OX(36). Was challenged for ONY when I front hooked OX to an existing NY. Heard my opp remark the phrase "ONY is only in Collins" several times to himself when the challenge was unsuccessful. Made a mistake of opening up the board and allowed my opponent to narrow the spread with a bingo of UNGATEd(78) but I still managed to win. Won my second game with 454 to 300. Our team also won the match 3-2. Lunch was provided by the organisers. It was not very good! After lunch, my third draw resulted in my team playing against NP. An important match for us as a win would guarantee at least a second place. 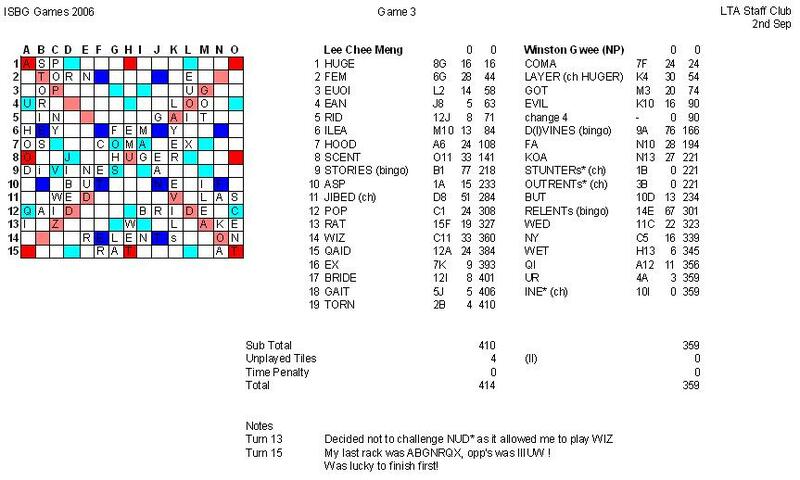 I was matched against Winston Gwee whom I have played several times before. 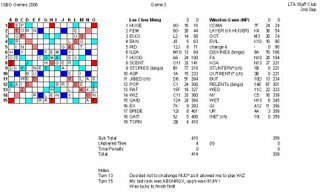 Our scores were very close when he bingoed with DiVINES(76) and I bingoed with STORIES(77). 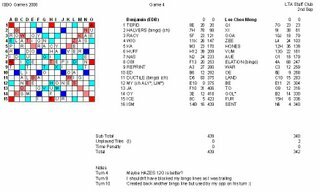 I widened the gap when he tried twice to form a bingo with an ENRTTU? rack but was unsuccessful. He tried STUNTERs* and OUTRENTs* but both were challenged off. There are two 7-letter bingos if we treat the blank as an S and two 8-letter bingos through a floating S with the blank as something else which he failed to see. I got the Q, X and Z very late in the game but was lucky to be able to put all of them down thanks to a phoney that my opp put down which I chose not to challenge. He formed WED/NUD* which allowed me to form WIZ and then QAID later. 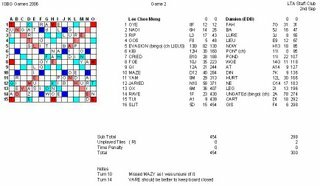 Would definitely have lost if I had to eat both the Q and the Z which would minus 40 points from my score instead of scoring more than 50 points with them. Won my third game with 414 to 359. Our team lost the match narrowly 2-3. Our final game was once again against EDB. They had one player short, so it was important that our lineup does not result in our best player playing against the missing player. I made a bad choice of lineup and the exact thing that we wanted to avoid happened! My score had been decreasing consistently since the first game while my opponent's score had been increasing consistently. Somehow had the feeling that I might lose this game. 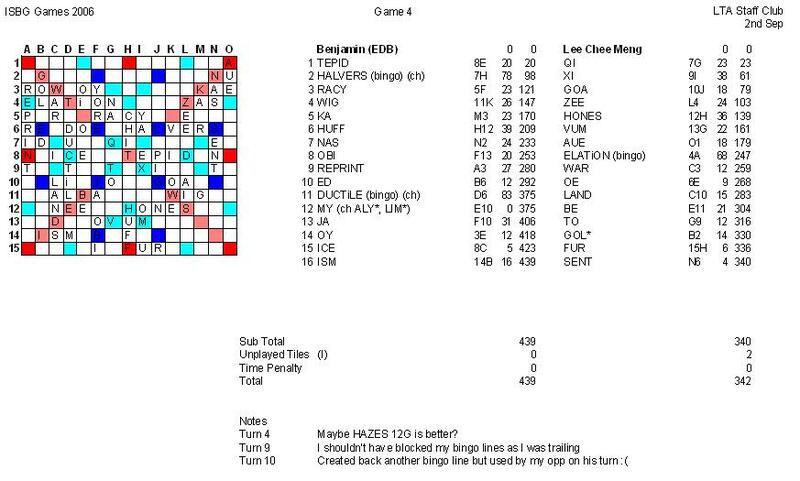 My opp bingoed with HALVERS(78) and I almost caught up when I bingoed with ELATiON(68). Was plaqued with consonants after that and I lost inspiration on what to do. Tried to open up but my opp extended his lead when he bingoed with DUCTiLE(83). Played badly and made many low scoring moves to end the game. Lost the last game 342-439. Our team lost 2-3 and came in 7th. We managed to play with the eventual 1st and 3rd place winners which were NP and EDB respectively. A pity that we lost in the 3rd game, otherwise we might be able to play with the 2nd place winners, NUS as well!